Urs Hölzle served as the company's first vice president of engineering and led the development of Google's technical infrastructure. His current responsibilities include the design and operation of the servers, networks and datacenters that power Google. He is also renowned for both his red socks and his free-range Leonberger, Yoshka (Google's top dog). 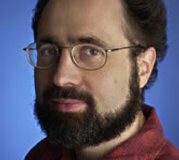 Urs joined Google from the University of California, Santa Barbara where he was an associate professor of computer science. He received a master's degree in computer science from ETH Zurich in 1988 and was awarded a Fulbright scholarship that same year. In 1994, he earned a Ph.D. from Stanford University, where his research focused on programming languages and their efficient implementation.